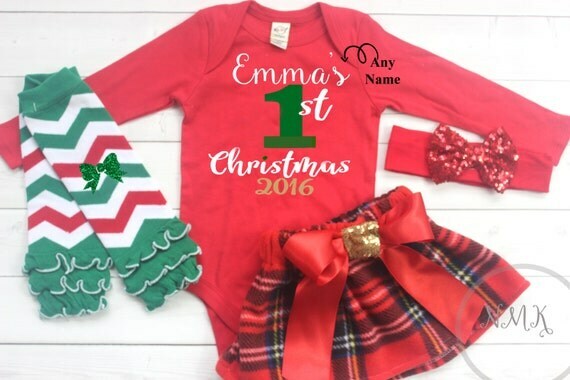 Signature sparkle long sleeve shirt with your childs name. Sparkle will not peel, flake or rub off and come extra sparkly. *Important- please leave childs name at checkout. We can only print 1 name please. 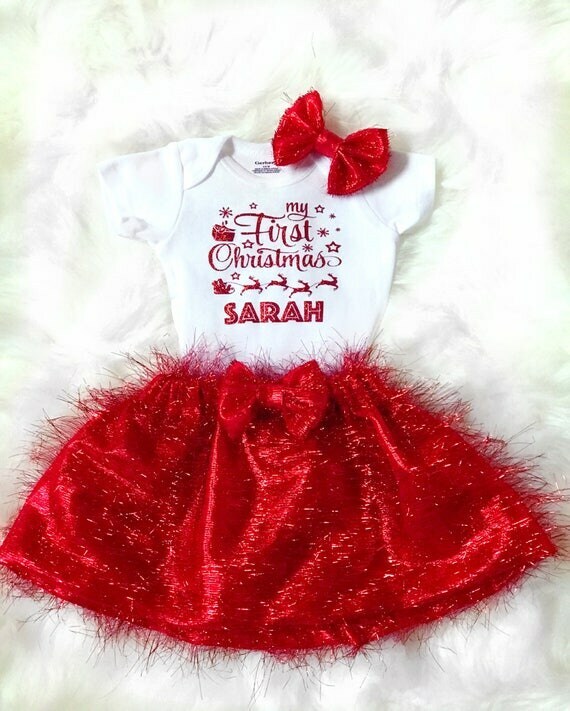 Sequin red skirt with white tulle lining for extra puffiness and gold sparkle bow. 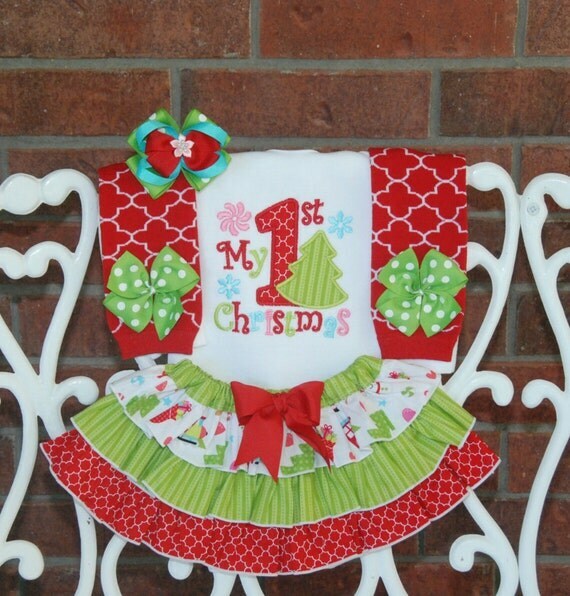 Messy sequin bow in red with festive green and white stripe wrap. Band measures 16″ not stretched. 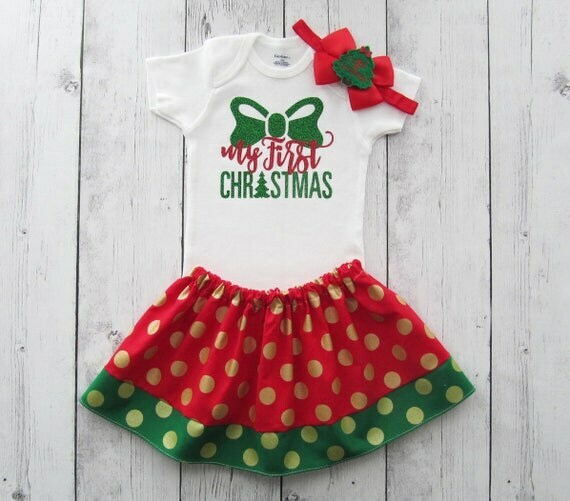 Beautiful three pieces Christmas outfit for a baby girl. 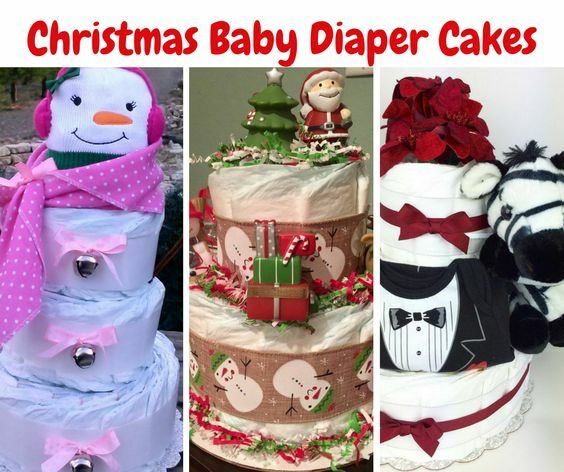 Perfect for Christmas celebration, Christmas dinner, Christmas photo session, open the presents and more. 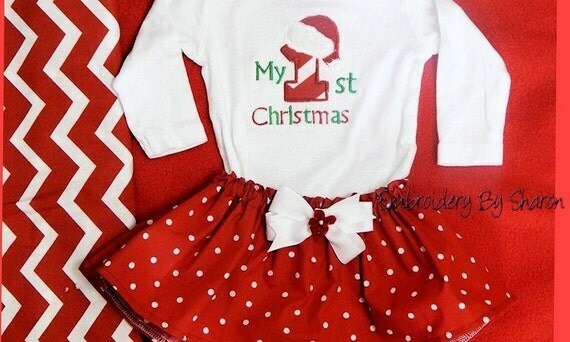 Dress your little girl in this adorable custom Christmas outfit. 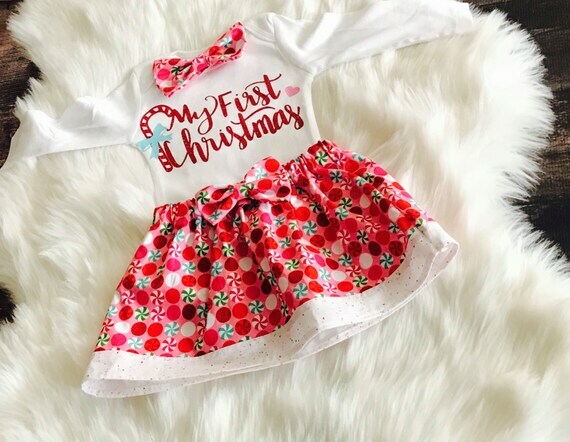 It is perfect for those holiday photos and family Christmas parties! • Skirt with attached gold satin bow. 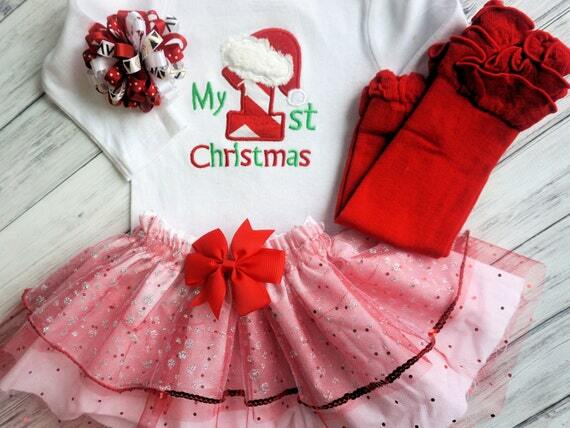 Adorable 4 piece My 1st Christmas Santa outfit for baby girls! 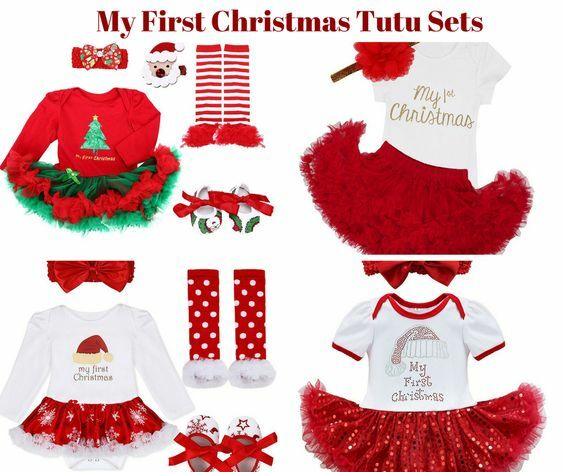 This adorable set is perfect for her first Christmas, a winter photoshoot, or a holiday gathering. 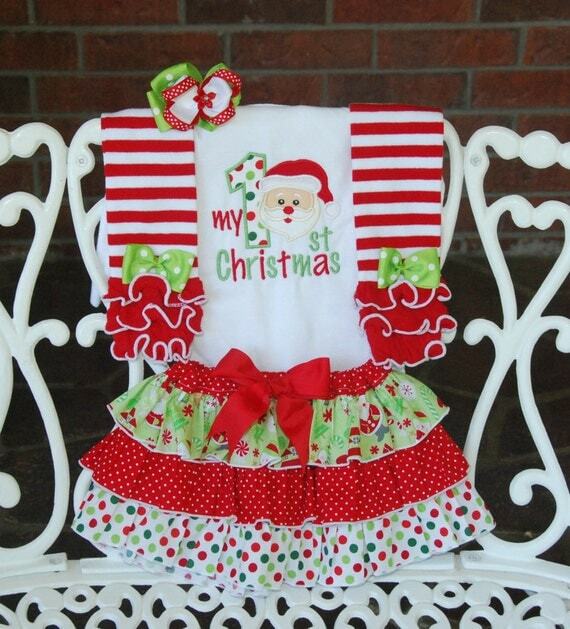 The skirt is a gold and white chevron with a satin red bow. 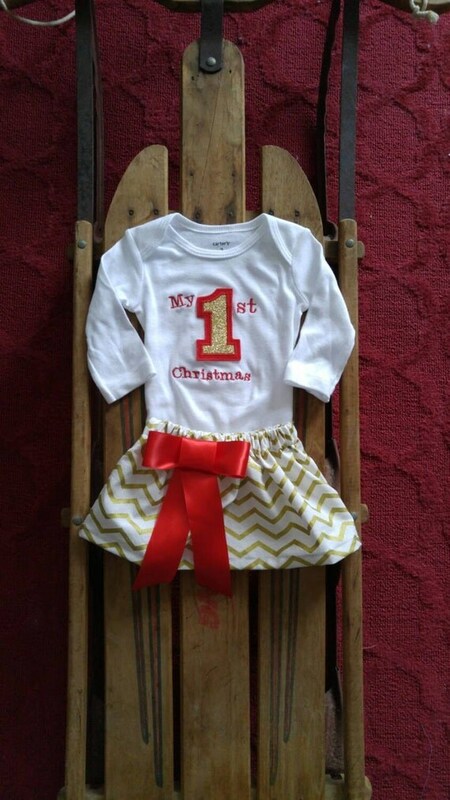 The bodysuit has “My 1st Christmas” embroidered with gold* “1”. 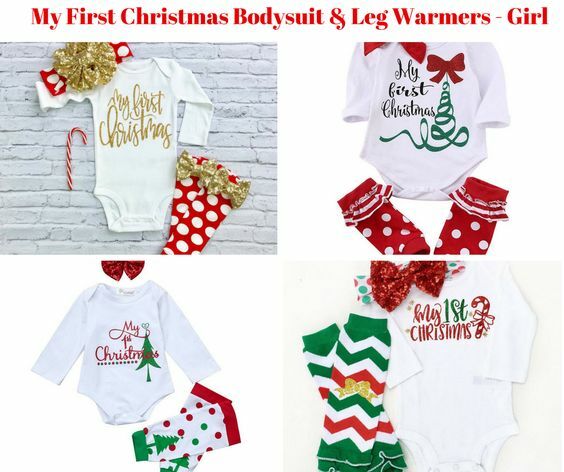 Goes great with a pair of leggings or leg warmers! I use Carter’s bodysuits. Short sleeved are also available. 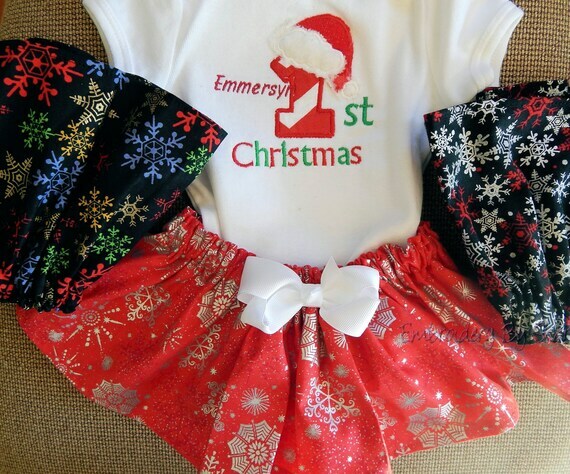 The skirts are to coordinate with the onesies size and a comfort fit with elastic band, but I can customize them longer or shorter if you would like. 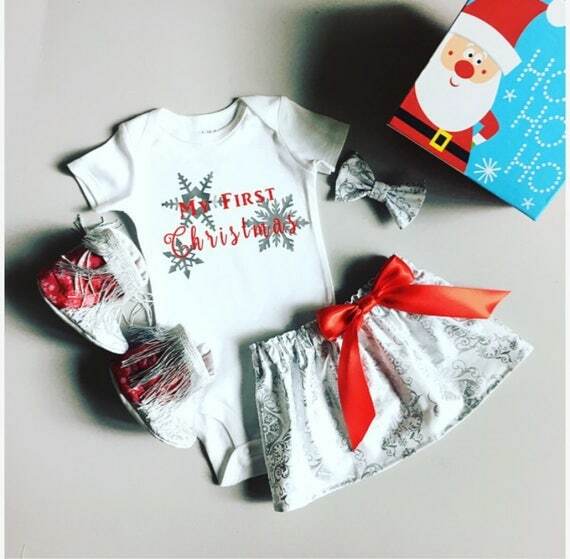 All embroidery is protected with soft backing so your little one stays comfortable. 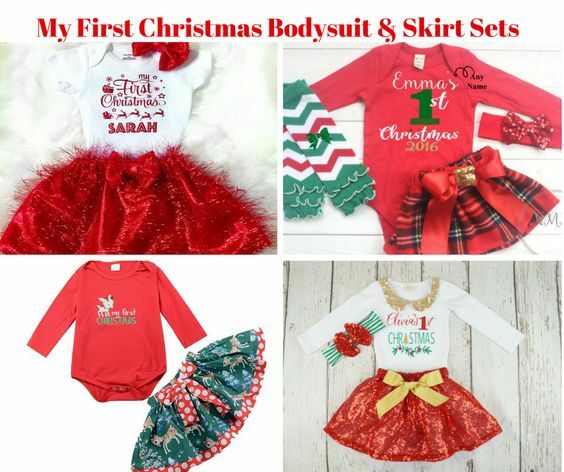 Christmas outfit perfect for Christmas parties, photo shoots or everyday wear! 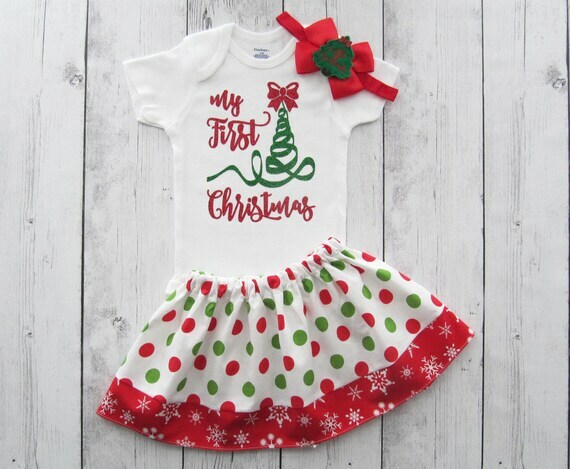 “My first Christmas” graphic will be made on a bodysuit for sizes newborn up to 12 months and will be made with the saying “Merry Christmas” on a bodysuit sizes 18 months – 24 months and on a long sleeve shirt 2T-5T. Girls skirt with elastic waist. 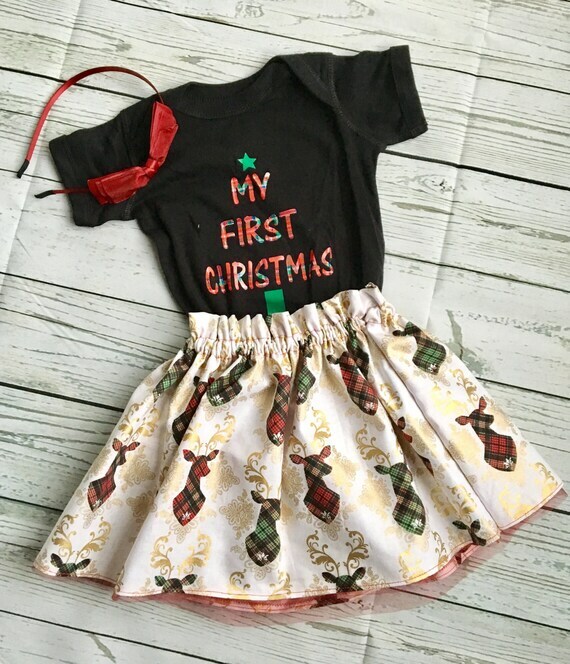 Skirt and bow are in a snowflake heart pattern. 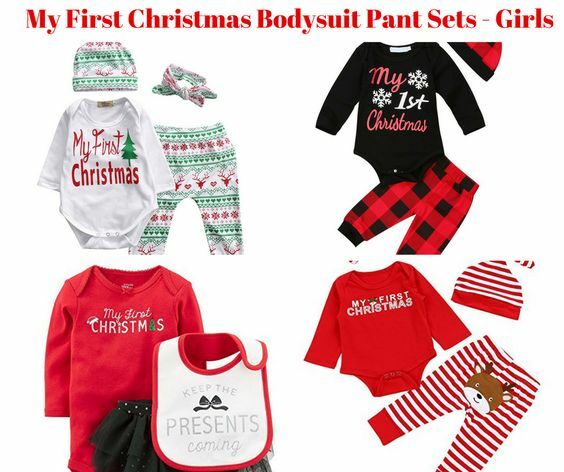 For sizes newborn up to 5T. 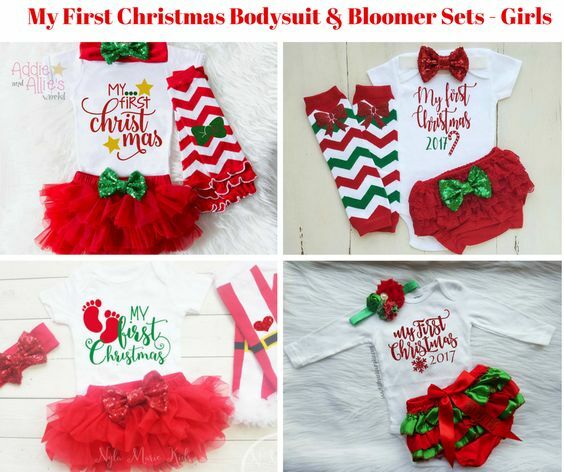 Set comes with Silver snowflake “My first Christmas” bodysuit, clip in hair bow (you can opt for a headband just put “headband” in the note to seller box upon purchase!) White and silver skirt and silver and red poly chain fringe booties! Order with long sleeves or short sleeves. 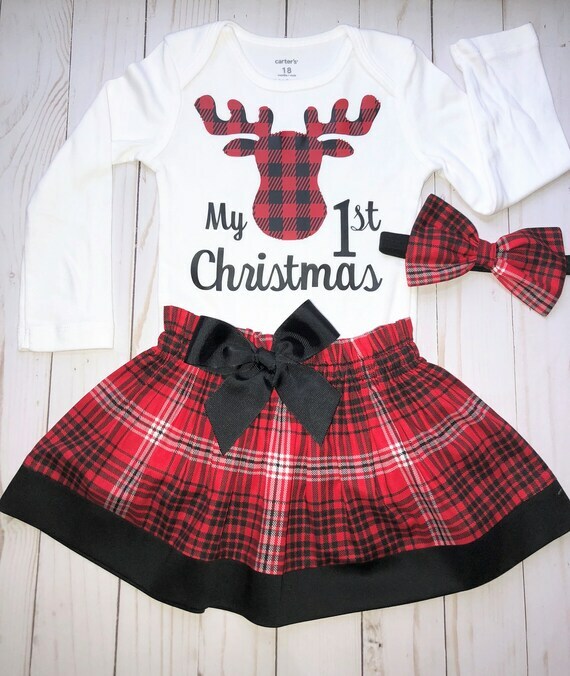 Adorable 4 piece My 1st Christmas outfit for baby girls! 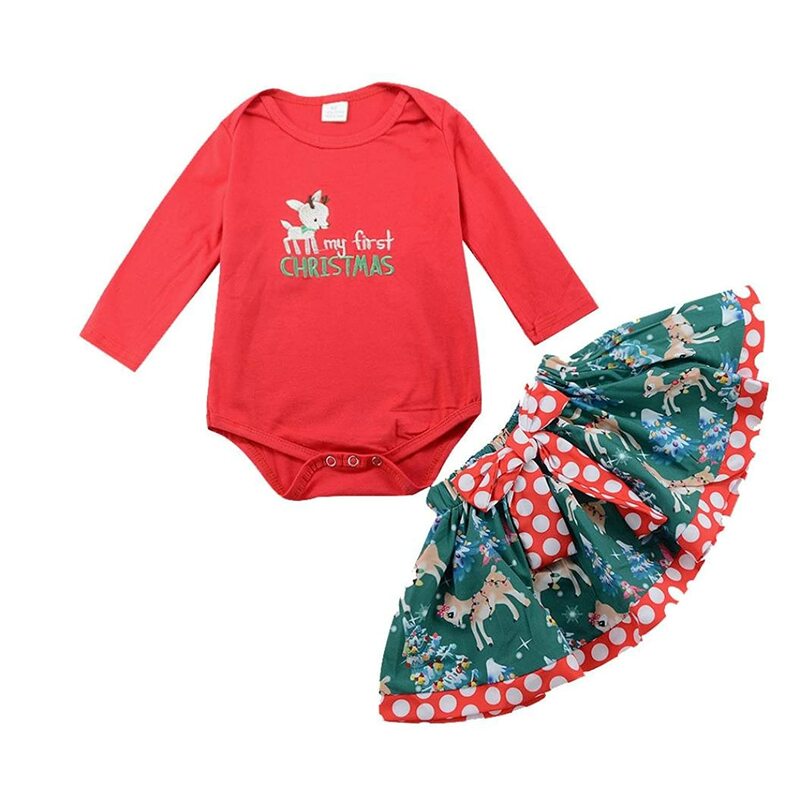 Limited Edition Christmas Plaid and Reindeer Outfit. Our stylist recommends pairing it with tights and a cardigan for a complete stylish outfit. Since the waist band for the skirt is made out of a stretchy elastic, my measurement is an approximate and can fit almost double the waist measurement when stretched. Custom order for a larger size, different fabric and styles are also welcome. 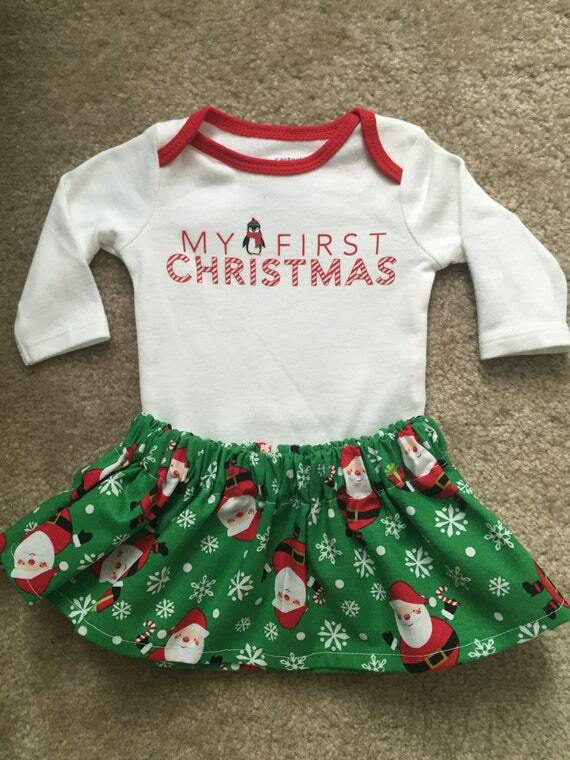 Baby’s First Christmas Outfit – Bodysuit and Skirt. 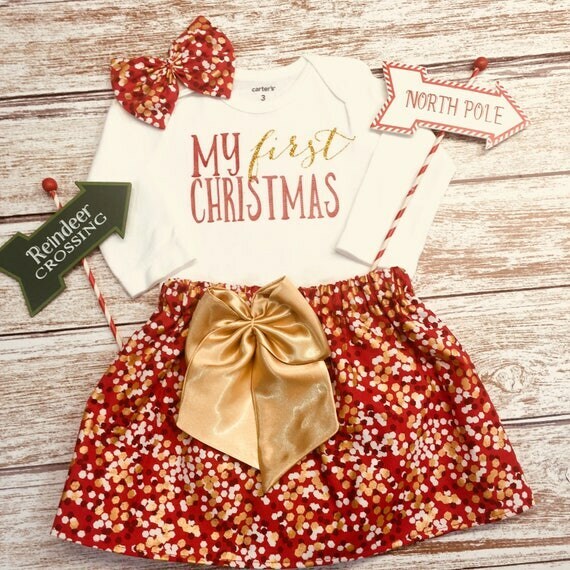 Set comes with Silver snowflake “My first Christmas” bodysuit, clip in hair bow (you can opt for a headband just put “headband” in the note to seller box upon purchase!) red and silver snowflake skirt and silver poly chain fringe booties! 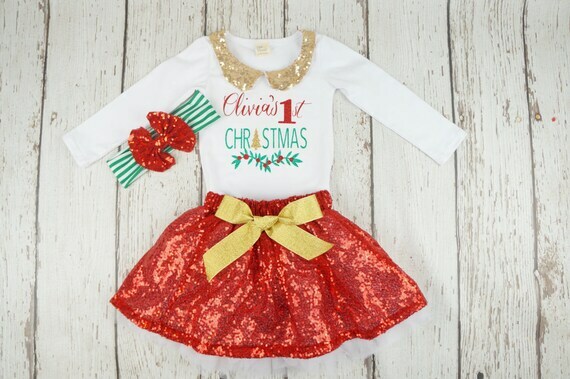 This cute white cotton bodysuit features an adorable red sparkly skirt and matching leg warmers. Only top quality embroidery thread is used to ensure color brightness and durability wash after wash.